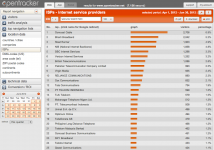 Use the ISPs report to see which ISPs are the most popular for your site. This may be helpful if you have any reason to consider different trends, technologies or marketing opportunities, or are simply interested in how people connect to the internet. This report lists all known ISPs through which people visited your site. The report can be filtered by entering a ISP name into the search field, located in the Options bar. The columns in the table are; No., ISP (click for google redirect), Graph, Visitors, Visits, Avg. pv/ v, Percentage. The ISP report displays all visits to your site filtered by ISP. Visually, the report is made up of a list of all ISPs from which visits were identified, in order of popularity. There is a column entitled ‘visitors’ – by clicking on any number in the visitors column, the report also provides a link to clickstreams of visitors from that ISP.